The potential of immunotherapy in the battle against cancer attracted international interest after two researchers received the coveted Nobel Prize for exposing the ability of the immune system to remove tumor cells. However, the researchers’ method, which prevents cancer cells from shutting off the powerful T-cells of the immune system before they can attack tumors, is just one of the ways to use the natural defenses of the body against the deadly disease. Now, a group of Vanderbilt University bioengineers has reported an important development in another, that is, penetrating tumor-infiltrating immune cells and turning on a switch that informs them to begin fighting. To do that, the researchers created a nanoscale particle and experienced initial success when they used it on human melanoma tissue. Tumors are pretty conniving and have evolved many ways to evade detection from our immune system. Our goal is to rearm the immune system with the tools it needs to destroy cancer cells. Checkpoint blockade has been a major breakthrough, but despite the huge impact it continues to have, we also know that there are a lot of patients who don’t respond to these therapies. We’ve developed a nanoparticle to find tumors and deliver a specific type of molecule that’s produced naturally by our bodies to fight off cancer. John T. Wilson, Assistant Professor, Chemical and Biomolecular Engineering & Biomedical Engineering, Vanderbilt University. Known as cGAMP, the molecule represents the main way to switch on the so-called stimulator of interferon genes (STING) pathway—a natural mechanism used by the body to mount an immune response that has the ability to clear out malignant cells, or attack bacteria or viruses. 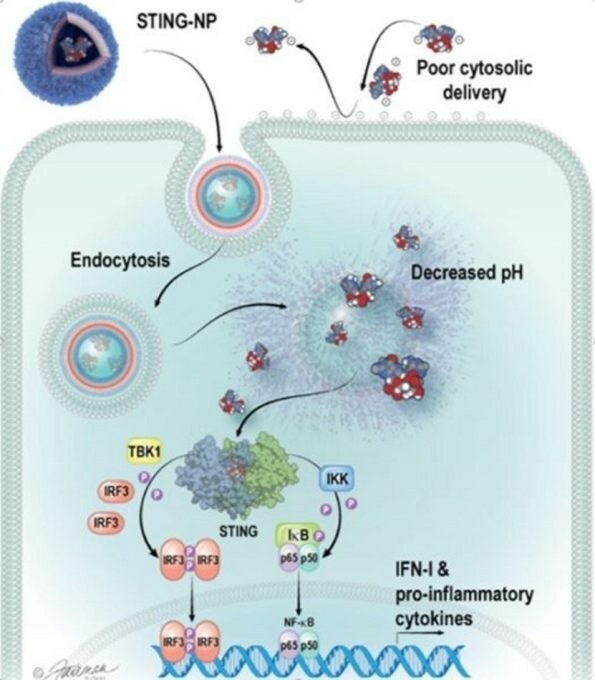 Wilson informed that the nanoparticle developed by his team delivers cGAMP in such a way that it triggers the immune response within the tumor, leading to the development of powerful T-cells that not only would kill the tumor from the inside but would also enhance responses to checkpoint blockade. Wilson added that while the study performed by the Vanderbilt researchers concentrated on melanoma, the work also indicates that this could affect the treatment of various cancers, such as lung, breast, head and neck, kidney, neuroblastoma and colorectal cancer. The findings have been reported in a paper titled “Endosomolytic Polymersomes Increase the Activity of Cyclic Dinucleotide STING Agonists to Enhance Cancer Immunotherapy” in the journal Nature Nanotechnology. Daniel Shae, the paper’s first author and a PhD student on Wilson’s team, stated that the process started with the development of the right nanoparticle, constructed with “smart” polymers that react to pH changes, and these changes were engineered by him to improve the cGAMP’s potency. After 20 or so iterations, the researchers discovered that cGAMP can possibly be delivered and STING could be efficiently stimulated in mouse immune cells, then in mouse tumors, and ultimately in human tissue samples. “That’s really exciting because it demonstrates that, one day, this technology may have success in patients,” stated Shae. Their collaborators included Vanderbilt School of Medicine professors Justin Balko, Manny Ascano, and Doug Johnson. The study was supported by National Science Foundation grant CBET-1554623, Alex’s Lemonade Stand Foundation grant SID924, National Institutes of Health grants K23 CA204726/CA/NCI, R00CA181491 and 5R35GM119569-03, a Vanderbilt-Ingram Cancer Center Support Grant, a Vanderbilt Ingram Cancer Center Ambassador Discovery Grant, a VICC-Vanderbilt Center for Immunobiology Pilot Grant, Melanoma Research Alliance grant 503565, and Stand Up To Cancer Innovative Research Grant SU2C-4.